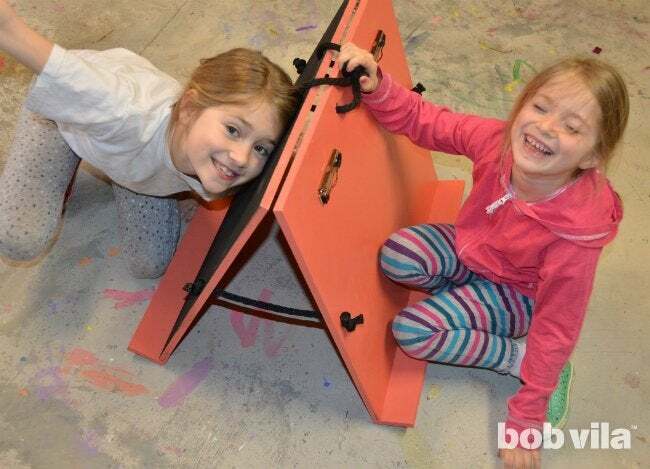 With a tabletop easel, you can take your art to go! Look tempting? 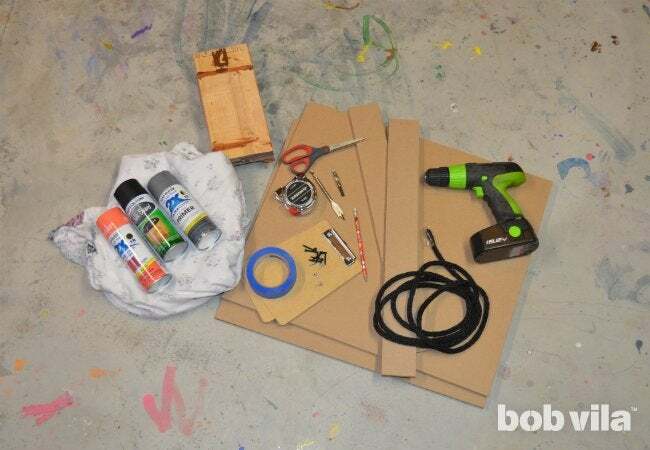 Let this photo tutorial walk you and your family through the steps of making your own DIY art station. Nothing makes a young, aspiring artist feel accomplished quite as much as having an easel to work on. But a traditional easel can be bulky, and as a result it can end up largely confined to a basement or craft room. 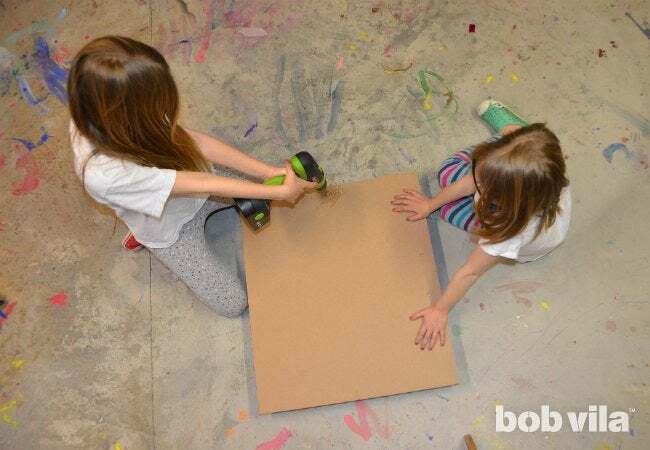 To give my two arts-and-crafts-loving girls the freedom to always be able to take advantage of the best natural light, we DIYed an on-the-go tabletop easel that’s easy to transport anywhere—to the kitchen, the back porch, or even outside. 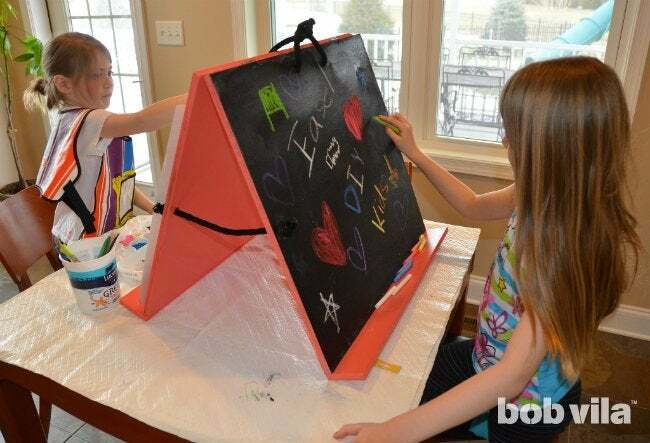 Thanks to our careful planning, this easel is suitable for all sorts of projects: We coated one side in chalkboard paint and outfitted the other with clips that can hold paper as large as 18 inches by 24 inches. The little tray at the bottom of this MDF beauty can even switch from holding a paintbrush or chalk to steadying a canvas! 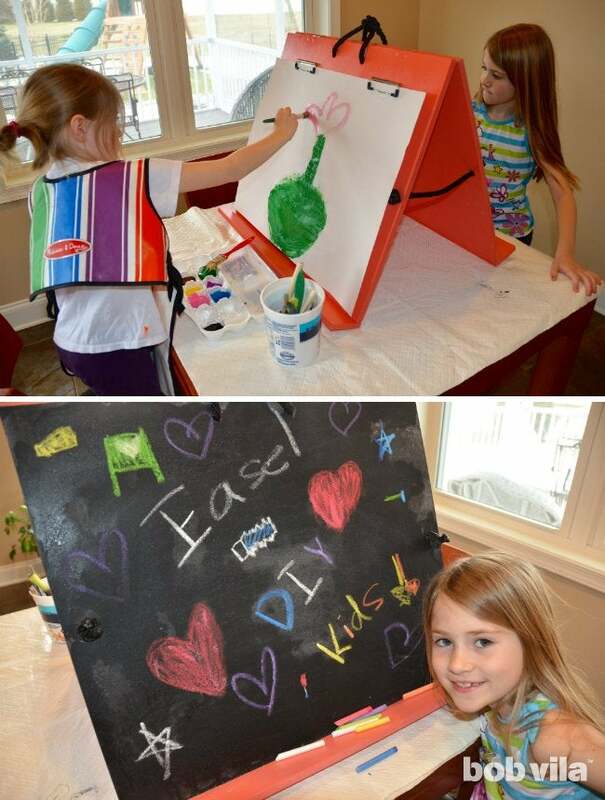 This portable easel is exceptionally customizable, so feel free to adapt it to your family’s needs. 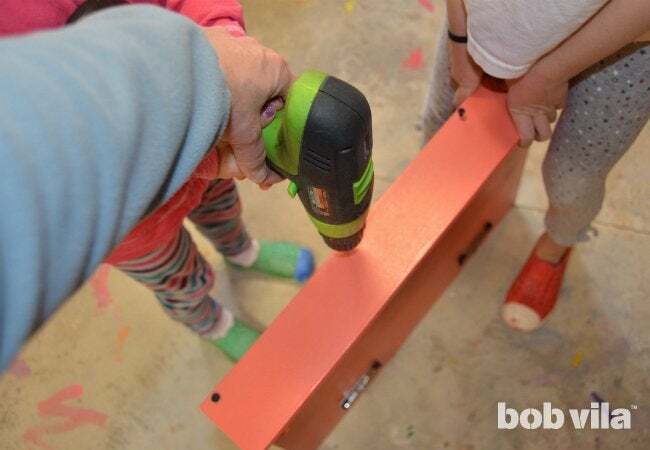 With only three cuts (which, by the way, big-box hardware stores are generally happy to make for you), this project involves just painting, drilling a few holes, and driving a few screws. 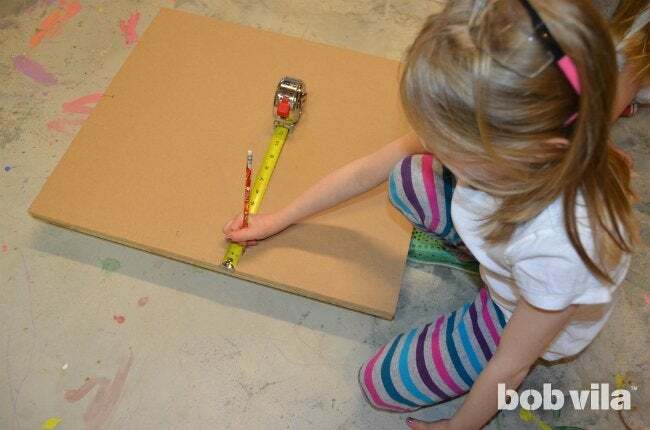 Cut 3 inches from the width of the MDF project board so you’re left with two pieces: a larger board of 21 inches by 4 feet and a skinnier length that’s 3 inches by 4 feet. On each board, measure and mark the midpoint of the longer, 4-foot, side; the midpoint will be 2 feet (24 inches) in from either end. Saw the boards exactly in half at this point. You’ll be left with four pieces—the pair of 21-inch by 24-inch boards will become the panels of your tabletop easel, and the two 3-inch by 24-inch boards will be the trays for resting art supplies. As always, if you don’t have a circular saw at home, check with your home improvement store where you pick up the MDF to see if they can make the cuts for you. 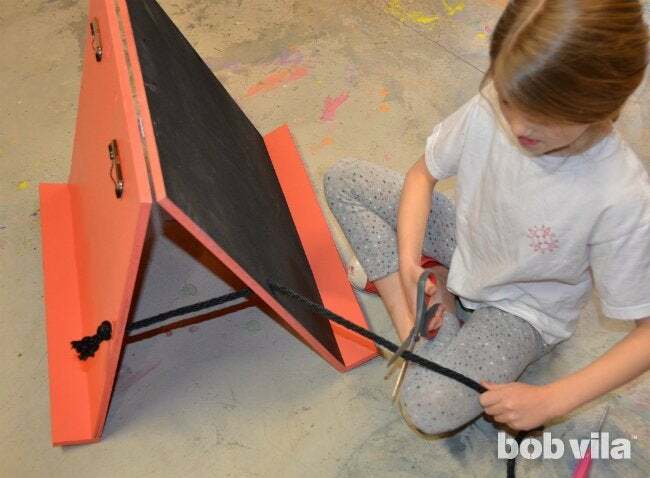 This portable easel is carried by a rope handle, and lengths of rope also supply tension between the two panels so they won’t slide all the way open while your kids (or you!) are working on the easel. 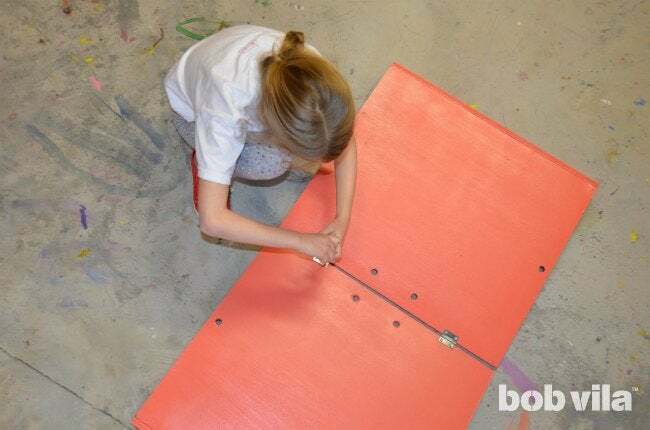 So, your first step is to drill holes in the panels to feed the rope through. Start by stacking the panels exactly on top of each other. Remember, your easel will be a little wider than it is tall, so the holes for the handle will will go through one of the longer, 24-inch, sides, and the holes for the ropes that hold the easel open will go through the shorter, 21-inch, sides. Orient the boards accordingly, and on the top board measure and mark for one hole on each 21-inch side, halfway down and about 1 inch in from each edge. These will be the holes that hold the tension rope. Next, mark the holes for the handle at the top of the panel by measuring to find the center (which should be 12 inches from either side), then marking two holes 1-1/2 inches to either side of the center and 1-1/2 inches down from the top edge. Using the 5/8-inch spade bit, drill the holes while the boards are stacked so the holes will match up perfectly. 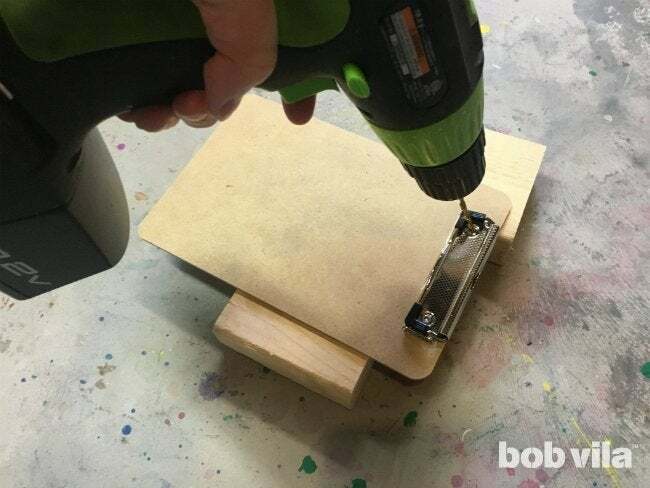 Clean up any rough edges around the drill holes with sandpaper. Now, wipe the panels down with a barely damp rag to remove the dust. Because it’s porous, MDF needs to be sealed, so be sure to prime both sides before painting it. Lay out an old sheet or a tarp so you don’t leave behind any unwanted splatter, and get to work! One helpful hint: Chalkboard paint will cover better over a darker colored primer. 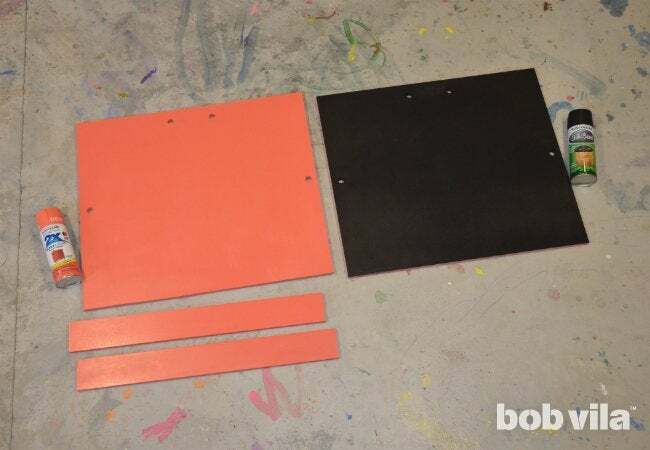 After the primer has dried, spray-paint all pieces (both sides) the color of your choice. Again, allow them to dry thoroughly before doing more work. 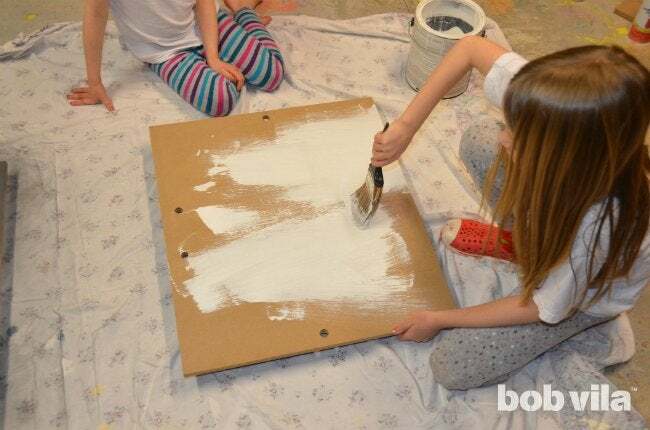 When they’re dry, spray one side of one panel with chalkboard paint. You can either purchase clipboard clips online or get a couple of cheap clipboards and drill the rivets out of the clips to remove them. The rivets are aluminum and softer than any drill bit. Just find a drill bit that is slightly smaller than the rivet, and drill at it from either side. It should come loose fairly easily. Place the clips (store-bought or “stolen”) onto one side of the panel without any chalkboard paint—this side of the easel will be used for takeaway artwork, the kind you can frame or stick on the fridge! Position the clips at the top of the panel (the end that has the pair of holes for the handle), placing each one 3 inches from the top and 4-1/2 inches from the sides. This should leave enough room for the clips to hold a large piece of newsprint. 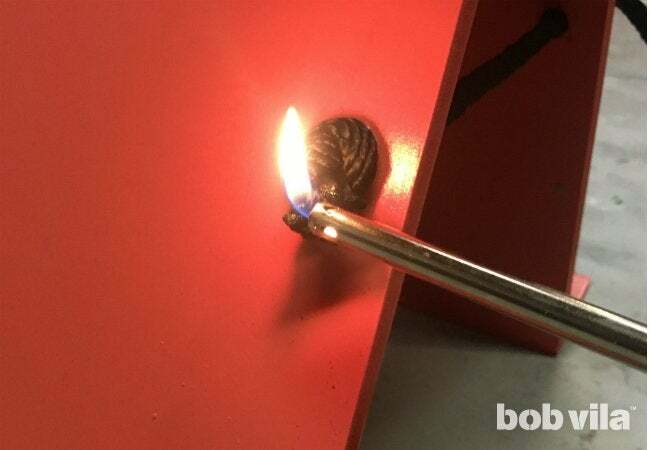 Use a pencil to mark the clips’ holes, then predrill the holes for the 3/8-inch screws, and screw each clip in place. 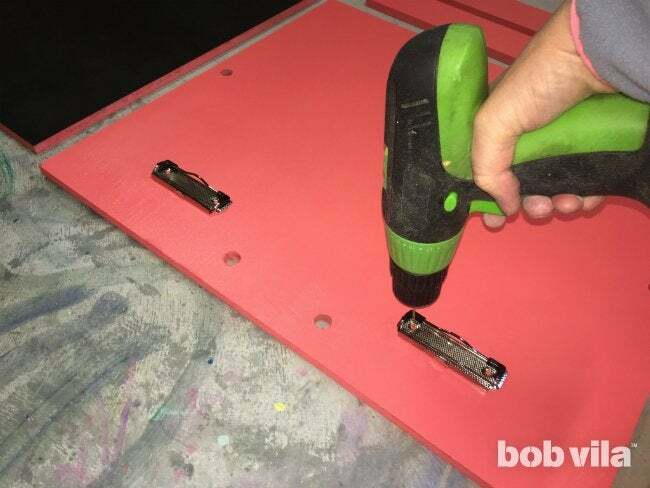 Attach a 3-inch tray piece to the bottom of one panel using four drywall screws. Repeat on the second panel. 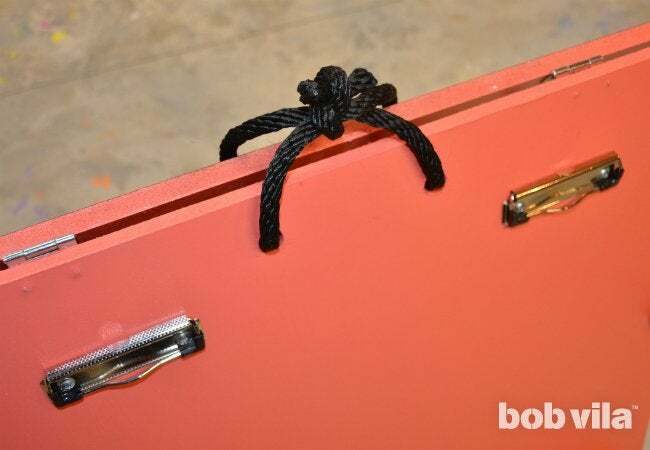 Now, turn both panels face down—the chalkboard and clips will be resting on the floor or work surface—with their top edges touching, and connect them using two hinges. Position each hinge approximately halfway between one of the rope handle holes and the outside edge, then screw one plate of each hinge to the top of the chalkboard side, and the other to the clip side. Knot one end of the rope and thread it through the front of one easel panel, then measure 2 feet out on the rope and cut it. Thread the cut end through the other panel (this time through the back and out the front), and make a knot, leaving about 14 to 18 inches of rope between the two knots. Repeat the process on the other side. Trim the rope at each knot, then either wrap a piece of tape around the ends or melt them with a lighter to keep them from fraying. Note: You can melt poly rope but not ropes made of natural fibers. Go with tape if you’re using the latter. Finally, thread a length of rope through the holes in the top of the easel panels and tie the ends together to create a handle. With the handle in place, you’re ready to carry your DIY easel wherever you want to paint or draw. After your art session, your easel can be folded up flat so that it can stand unassumingly in a corner, at the back of a closet, behind a door, or anywhere you choose to stash it until the creative impulse strikes again.